This care sheet is for beginners and covers the basic maintenance of the Eastern Water Dragons (Physignathus leseurii). You should join your local herpetological society, where you can meet others and obtain more detailed information on keeping these lizards. Water dragons are very hardy animals and one of the best dragons for beginners to keep as long as a few important guidelines are followed. These cover cage size, lighting and diet. hatchlings measure around 15cm in total length. They can grow up to 90cm long although more usually they range from 60 to 70 centimeters. Juveniles: Hatchling Water dragons can be kept in a large plastic tube, approximately 60cm long, 40cm wide and 40cm high. The lid of the tub should be placed outdoors to give the little dragons access to ultra violet light. It is very important not to put them out in the sun during the middle of the day. Glass fish tanks should not be used for this purpose as the temperature inside the tank will very quickly reach a level that will kill the dragons. Shade and water must be provided at all time and the dragons checked regularly. Adults: To keep adult Water dragons in captivity a large outdoor enclosure is required with access to sunlight. Outdoor enclosures can take two forms -- converted aviary style enclosures, or the more typical reptile pits with walls made of sheet metal. It is essential that the walls of the pit are at least 1 metre high and preferably 1.2 metres, as Water dragons are excellent jumpers and will take advantage of any rock piles or or branches inside the enclosure that are placed too near the walls. The walls should extend at least 30cm underground to prevent the dragons from digging out. Alternatively, weld mesh can be sunk beneath the ground. If an aviary is used, it is important to use sheet metal to a height of 1 metre from the ground to prevent the dragons from rubbing their snouts on the wire. Both types of enclosures can be decorated with plants, logs, rock slabs, etc. A pond must be included to satisfy their semi-aquatic lifestyle. Some of the enclosure should be sheltered from the weather. 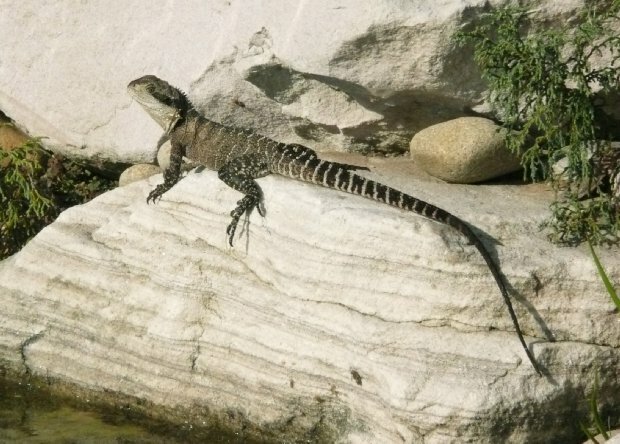 To keep an adult pair of Water dragons, the enclosure must be at least 1.2 metres long and preferably more than 2 metres, with a width of 1 metre. the floor can be covered with bark chips or leaf litter. A pond or at least a water dish large enough for the dragons to submerge themselves is essential. There must be at least one hiding place for each dragon in the form of logs, sheets of bark pipes. Faeces and uneaten food must be removed promptly. Water dragons require basking spots with high temperatures (up to 45 degrees Celsius) to be kept successfully. Your enclosure must get plenty of sunlight and be sheltered. It must also provide shady spots that the dragons can move to. Basking spots can be created by installing 100W - 150W floodlights at one end of the enclosure. These lizards need UV light to survive, which is why they are best kept outdoors in natural sunlight. If they are kept indoors special UV type fluorescent tubes need to be installed. Before attempting such a set up, you should discuss the placement of these lights with n experienced keeper. water dragons are omnivorous, making them quite easy to feed. A suitable diet for adult dragons would include twice weekly feeding of canned pet food and mixed, chopped fruits and vegetables. They should also be fed a variety of insects such as crickets, cockroaches, meal worms and earth worms. Small mice can occasionally be offered but they should not form a major part of the diet. Once a week the food should be dusted with a calcium/vitamin D powder such as Rep-Cal®, and a multi-vitamin powder such as Herptivite®. Young dragons should be fed every day with as great a variety of insects as possible. Calcium and vitamin powders should be used every second feeding. In general, Water dragons will not accept pet food, fruit and vegetables until they have reached a total length of about 20cm. At this stage these foods can be gradually introduced into their diet. These are outside the scope of this basic care sheet. Any unusual behaviour or signs of illnesses should be discussed with an experienced keeper or with a veterinary surgeon. If you suspect something is wrong, act immediately, don't leave it. Early diagnosis and treatment is important.